Any baller growing up (in his 20’s) always dreamed of having that flubber shoe from the movie with Robin Williams that came out in 1997, for those who haven’t seen it, it was the story of a very weak high school basketball team who’s going to have the greatest invention from one of the schools teacher, the flubber would be put underneath the shoe and would give them extra powers and the most ridiculous bounce ever. Flubber: Apparently it is real! Yeah Right. 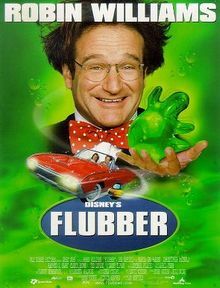 That’s right, Flubber, the green goo from the Disney movie of the same name that allowed all the terrible basketball players to suddenly become slam dunking all stars. Don’t believe me, have a look at the pictures below. 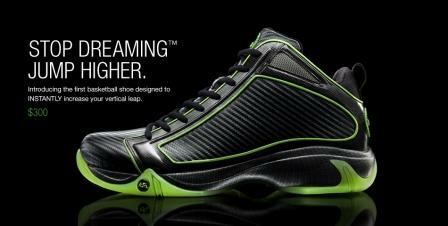 Well now in 2010 this shoe is available to the public for $300, the two inventors of the shoe are twins who walked on for USC basketball, and apparently there father was in the shoe industry. After a bunch of NBA players showed interest in the shoe during the summer (names can’t be revealed since they all have contracts with different shoe companies) the NBA finally said they wouldn’t allow the shoe to be wore on the basketball court.This shoe has created a huge buzz and i believe might still make its way to the NBA one day or another. where can I find it in MALAYSIA ??? I’ll do whatever it takes.. how much it cost in RINGGIT MALAYSIA ? ?